My 19lb 12oz common from Cuckoo Pool: probably one of the pool's originals, and probably not a Leney, but still magnificent. 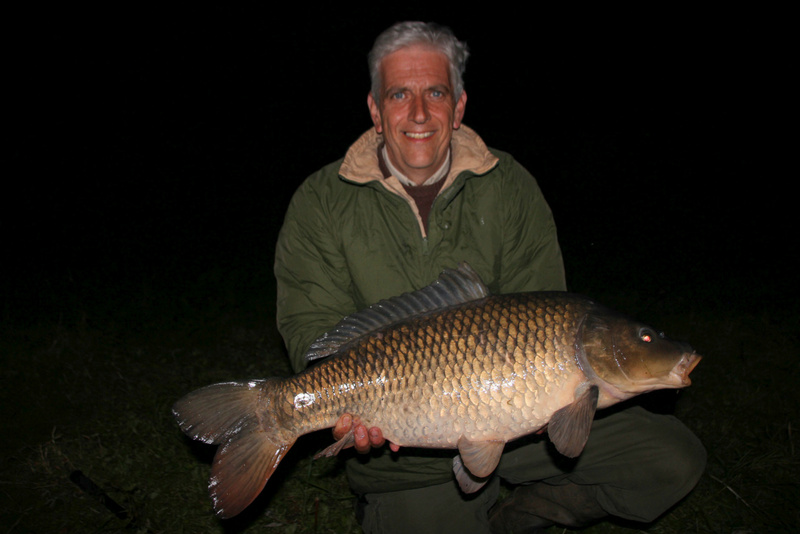 Nigel's 19lb 8oz common, captured after a dramatic night fight - and certainly a Leney. 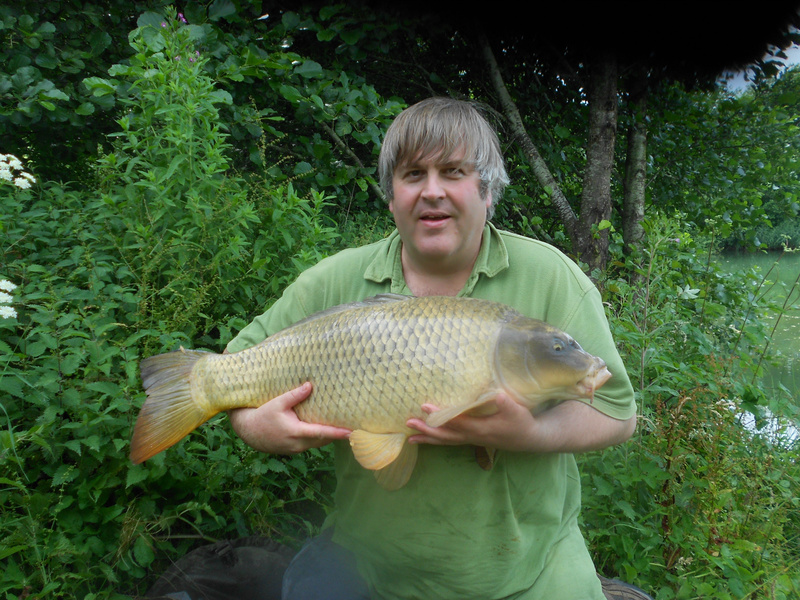 Removing my watch before a "trophy shot" with my 12lb 12oz Leney common. Playing out my third double of the session - another Leney. Leney perfection - my 12lb 12oz common. Battling my 'nineteen" - the closing stages. I spent last Friday (July 8, 2016) and much of Saturday fishing a very private pool containing Leney carp. 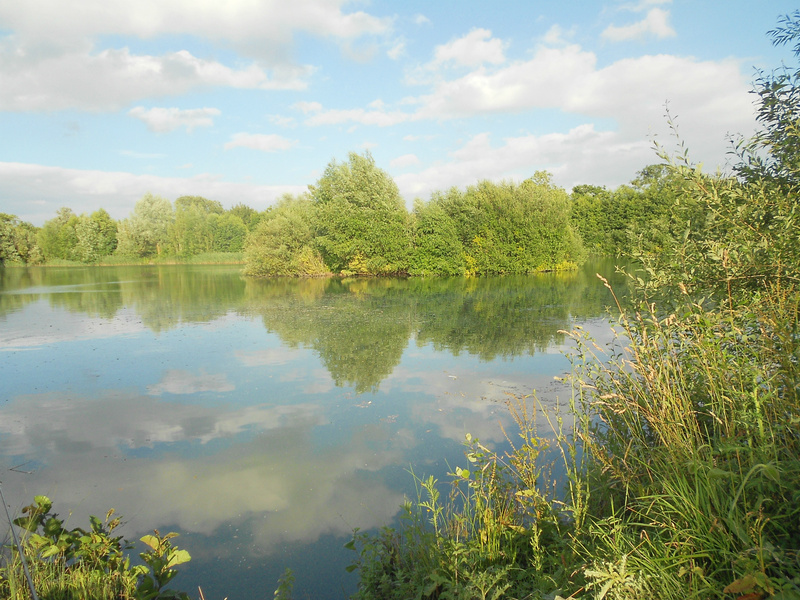 Cuckoo Pool is the passion of the former Redmire bailiff, the genial Rob Fox, and given the pool's astonishing beauty, it is not hard to see why. Rob is the friend of a friend from the Traditional Fishermen's Forum, Nigel "Snape" Evans, and Nigel invited me to accompany him for what would essentially be pioneering fishing. 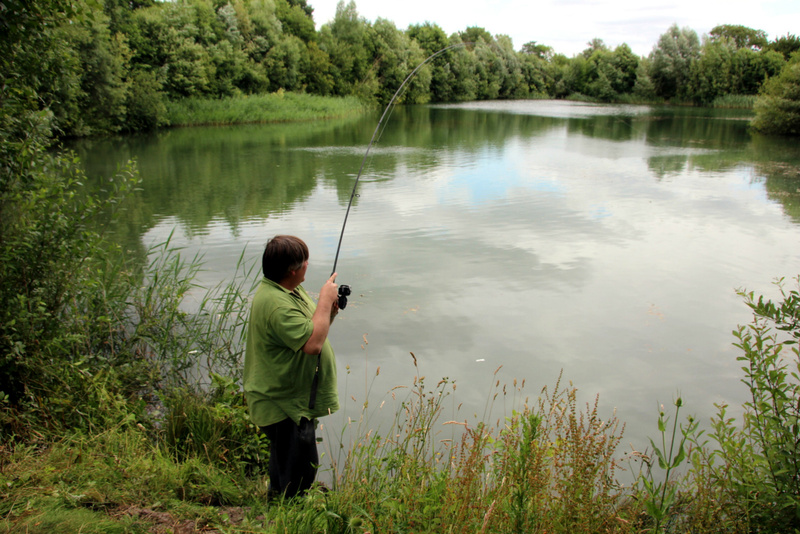 The pool, which is located "somewhere in the Three Counties" was stocked by Rob with Redmire fish some years ago, and they are growing at a remarkable rate - 3lbs a year or even more. 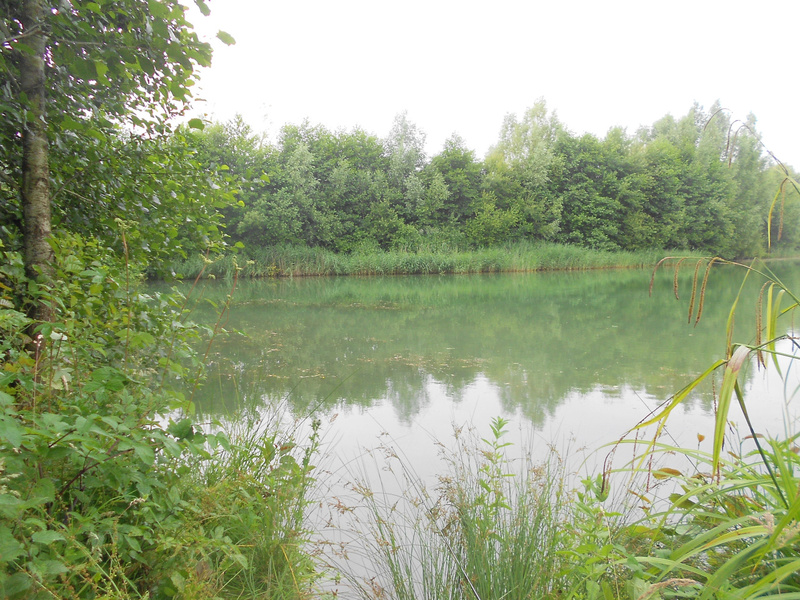 As a result, the 3.5 acre Cuckoo Pool already has Leney carp in excess of 25lbs, it is believed. But there is an older stock of carp in the pool, including a great shadowy "monster", which may have been washed in by floods some time ago. 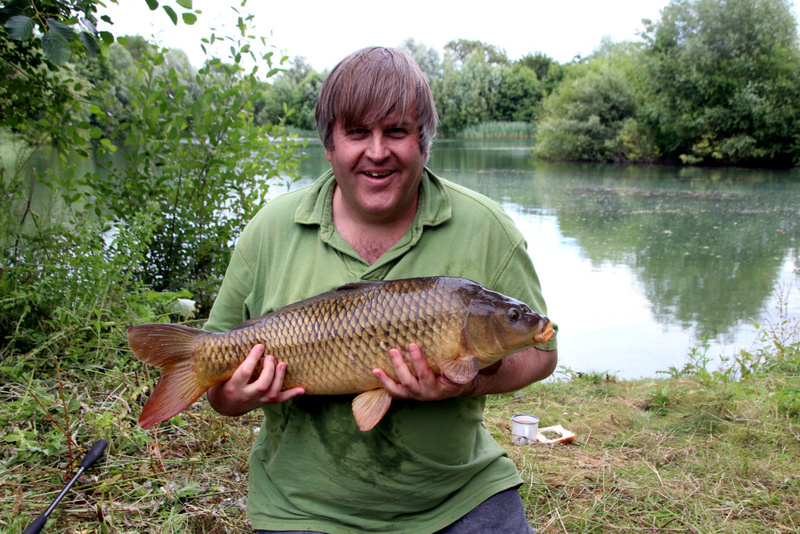 As it happens, my largest carp during the session - a light-coloured common of 19lbs 12oz, is probably not a Leney. It was an unknown common before I caught it, - on floating crust by a large semi-sunken branch. It is probably, then, one of the pool's original fish. However, some Leney commons are quite light in colour too, and so I would not quite rule it out as a Leney. Nigel wondered if it may have had a touch of 'ghostie' in its genes. Rob thought not, when he studied the images; and in fact it wasn't quite so 'light' as it appears in the pictures. It matters little to me, either way, as it was truly a magnificent carp, and so rotund, it's clearly a fish that wants to get bigger, and I predict an interesting future for this carp! That carp led me a right merry dance during the fight, - the first run took it almost to the island, around 60 yards away. It was a very powerful carp indeed. I caught three doubles - the nineteen, which is a PB common; a 12lb 12oz Leney and a 11lb 9oz Leney - all on surface bread and semi-stalking tactics. I even caught a Leney "scamp" of 1.5lbs, on float-fished corn, which shows that the Leneys are breeding in the pool. As for the pond's difficulty or otherwise: I found that the carp were very wary of taking even free offerings in open water. The twelve was caught at range, on a large floating ball of flake, up against a soft weed bed, and the two carp I managed from 'the corner with the branch snag' were fooled after I spotted regular "patrol routes" - with the nineteen taking by the branch, as I have said, while being in determined competition with two other, smaller carp. My last double of the session - a 11lb 9oz Leney, had been following a distinct patrol route, around a margin weed bed, and he actually returned three times, with other carp, before he took my crust. These carp, then, did not give the impression of being uneducated fish, although the pool had only been fished occasionally before, by Rob and his friends. 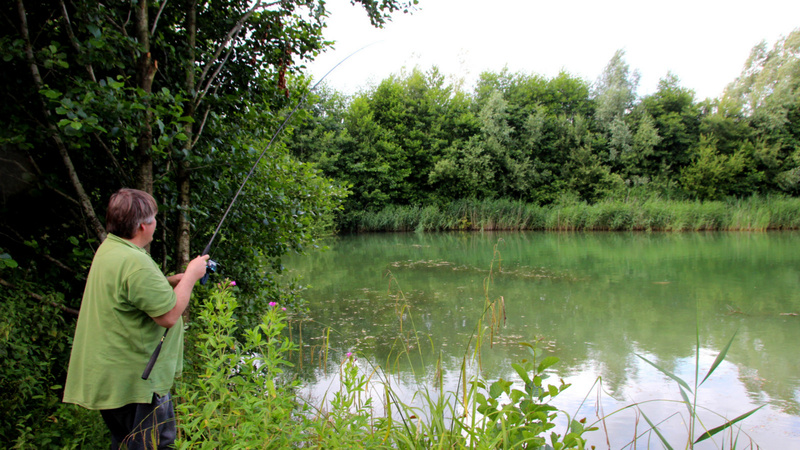 One of the highlights of the session was Nigel's capture of a 19lb 8oz Leney double by night. We were sitting there, chatting, both noticing the mysterious smell of carp, which blew in on the breeze, when Nigel's pin screeched out and a carp did its level best to bypass the island and head to the far bank! It was an incredible run, and the fight was not without its moments of high drama, - while the fish sulked in a weed bed before swinging left and free into open water. I can still see the bend of Nigel's cane MK IV against the sky. Memories like this, I think, are the reason we all go fishing, for they are priceless. Most of the carp came from Redmire, directly. There was an older re-existing stock, as the article makes clear.